The BC Rural Centre believes that a vehicle like Nova Scotia’s Community Economic Development Investment Fund (CEDIF) would be an ideal way to repatriate a portion of the investment funds currently leaving British Columbia, stimulate small business development and expansion, and provide a very effective rural development tool. FarmWorks Investment Co-operative Limited is a CEDIF cooperative that was incorporated in 2011. By the beginning of 2017, FarmWorks had invested $1,550,000 in 63 businesses representing various levels of the local food supply chain, including farms, local food retailers and restaurants. 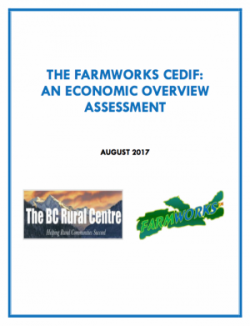 In a just-released report published by the BC Rural Centre, partnering with FarmWorks, a summary of results from a recent survey of FarmWorks’ current clients is presented. The intent of the survey was to quantify the general economic and social impacts of these businesses. The results of the client survey indicate that FarmWorks has had a significant positive economic and social return on its investment into local food related businesses in Nova Scotia. In total, 38 of the 48 current FarmWorks clients responded to the survey. Based on the survey results, the responding businesses had combined total annual business revenues in excess of $8,000,000 and combined total annual business expenditures of over $6,800,000. These 38 businesses reported the creation of 148 full-time and 110 part-time jobs since receiving their FarmWorks loans. Respondents indicated that they believed that 70% of these jobs were as a result of FarmWorks financing. There would obviously be very significant additional economic spin-off effects from the business and payroll expenditures of these businesses. 87% of the respondents indicated that they believed that the capital received from FarmWorks improved their business outcomes – with 40% of clients adding comments that they didn’t believe they would be in business without FarmWorks’ financial support. Quantifying the economic impacts of FarmWorks clients creates a better understanding of the impacts generated by FarmWorks’ investments and the CEDIF program. It is clear from the survey results that both FarmWorks and the CEDIF program are playing an important and significant role in supporting the creation and expansion of small businesses in Nova Scotia. The survey results also clearly demonstrate that the Nova Scotia CEDIF program has a very positive return-on-investment to the provincial government.